Cinnamon Biscuits. No Yeast, No Waiting, No Problem. So, when I married Jeff, I vowed to make his favorite cinnamon rolls on a semi-regular basis. That’s when I break out The Great Compromise: these Quick Cinnamon Biscuits. There’s no bringing ingredients to room temperature or even melting a little butter. You mix the dough by hand in one bowl, pat it into a rectangle, and roll the filling inside. Then slice the dough into rounds, place them in a baking dish, and bake them. Since the biscuits are packed in tight, they stay soft and gooey inside, just like a cinnamon roll. As vows go, promising to stick around in sickness and in health is one thing. But promising to stick around in sickness and in health with a lifetime of cinnamon rolls (and cinnamon roll-type treats) is way more fun. For the Filling: In a small bowl, combine the brown sugar, cinnamon and nutmeg. Set aside. Turn the dough out onto a lightly floured surface. Lightly flour your hands, and pat the dough into a 1/2-inch-thick rectangle, about 9 X 13 inches. Brush the surface of the dough with the remaining tablespoon of cream. Sprinkle evenly with the cinnamon sugar topping. Starting from the long side, roll the dough into a cylinder. Slice into 9 equal rounds. Place the rounds, cut side down, into an ungreased 8-inch square baking dish or a pie plate. Bake for about 30 minutes, until the biscuits are lightly browned. For the Icing: While the biscuits bake, mix together the confectioners’ sugar and milk or cream until smooth. When you remove the biscuits from the oven, immediately drizzle them with icing. Serve warm. These sound really good and easy – a winning combination in my book. I will definitely be trying these very soon! Oh YUM!!! I might have to give these a whirl! Yeasted coffeecakes and rolls are great, but I agree, sometimes you just don't want to wait! bless your heart! any method that'll get cinnamon-happy bread into my belly more quickly and with less effort is a treasure! wow I love it! This be great to make fresh in the morning for guests! I am taking the recipe to the kitchen now. I am not sure I can get them in before dinner but I can try. There are times, quick and easy are the only way to go. Thanks for sharing this. You probably made the lives of many cooks much easier. This is a great idea! I'm often deterred by the length of the cinnamon roll process, but now there are no more excuses. You'll be my kids' new favorite person! Oh wow – what a delicious recipe! I love making cinnamon rolls, but when I want something quick, that is not what I go for. This is going to be a winner with my family, I'm sure! seriously cannot wait to try these! oh i wish i had seen this over the weekend! i just had a fail with a fast cinnamon bun recipe. this looks sooooo wonderful. i will have to use this recipe next time. I love cinnamon rolls but hate the waiting! These look awesome. I'll definitely have to try them. I think I might very well have a coronary after seeing this. GAH! Looks SO good! YES!! finally a quick cinnamon biscuit!!! I bookmarked this page and will be making these shortly. THANK YOU!!!!!!!!!!!!!!!! can not wait to try these! will try next week for sure! Yes, yes, I think I can manage these. My poor kids have never had homemade cinnamon rolls. The closest has been the ones in a can you pop open and bake. I'm a bad, bad Mama! Thanks for the recipe! So, when I was in 8th grade, and took Home Ec, I learned a recipe for cinnamon rolls that didn't require yeast and/or rising. My best girlfriend would spend a Saturday night at my house, and we would trash the kitchen making them (and devouring them). They were the best thing going, except for the mess that we left behind. I may have to start keeping heavy cream in my fridge….ALL the time. This could be dangerous. Would milk or buttermilk be a suitable sub for the cream? Please tell me no because that certainly would be dangerous. Awesome. I've been working on a recipe like this too, just because I hate working with yeast so much. I'll have to try yours too! I just made these this morning. They turn out to be very very good. I could hardly tell that there is no butter, no eggs and no yeast in this recipe!! This one is definitely a keeper! Thanks! Oh my! These look fantastic. I definitely will try these — I have guests coming into town soon, so this looks like a great recipe for breakfast… Thanks for sharing! that's why i never make cinnamon buns, i can't stand waiting! these are just perfect for me. After seeing this recipe, I went right to the kitchen and made it. I made it gluten free so I can't comment how it compares to regular baking but I will share that my husband, the gluten free guy, loves them and ate them up quickly. This is a guy who loves my baked goods but they tend to be around for at least, a few days. I had one and it was very good but again, I can't compare gluten free to anything. Nowadays, it is really good and many people have no idea they are eating GF. Yum! Do you think they would turn out alright if I substituted milk for the heavy cream in the dough? Those look fantastic!! And I love that they're quick but also from scratch. Bookmarking now! As always.. another good recipe. So what was for supper on Meatless monday?? Oh, by the way, you have won an award on my blog, stop by please when you can. Just a wee thank you for sharing such a great blog that has been a great addition to my life. These look wonderful — and no yeast, how great. 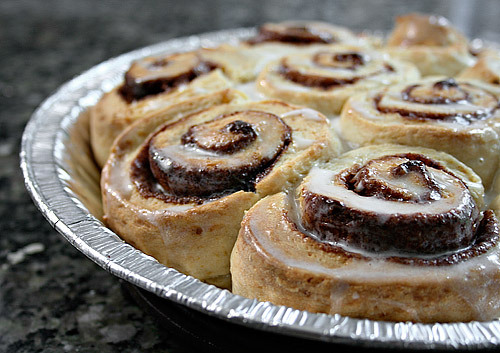 Can be put together quickly for breakfast — nothing like cinnamon rolls for breakfst — hot and fresh from the oven! I cannot wait to try these!!! I've never dared to try my mother-in-law's famous recipe because it is soooooo involved & time consuming, but I'll try these this week for sure! Sister – where'd you go? I'm jonesing for a post from you – 10 days – really? That's a little excessive wouldn't you say? Hope you're having a swell time with whatever you're doing! I just served these to my kids and they all gave me 2 thumbs up! Thanks for posting a quick alternative to cinnamon rolls. We will definitely be making these again and again. Beautiful pics. Those look really yummy! I've wanted to make the yeast kind of cinnamon rolls for the longest time, but like you said.. it can take a really long time. The thing I'm most worried about is the part where I eat them all. Your nonyeasted version looks really good. I've seen some quick method ones, but yours look so nice an smooth.. not raggedy. Wow! This is my dream come true. Seriously, I always want to make cinny rolls, but I can never find a recipe that tells you how to do it without gobs of lead time. I can't wait to try this. You are genius, and I bow in your direction. Made these for my husband's birthday breakfast – hope you don't mind if I link to your post and recipe! You are a bad, bad girl for getting us all addicted to these. I think everyone on Twitter has made them at least twice. Really good and easy. What more could you ask? Just pulled them out of the oven. Definitely missing the yeast-y taste but definitely a worthy substitute when I'm short on time! I made these this morning, but had to add a bit more flour – other than that they were amazing! Thank you for the recipe, I posted in on my blog with a link to your site. Thank You!! I just made these, having never made homemade cinnamon rolls before. I followed the recipe, except adding some vanilla to the icing just to give it some flavor. My boyfriend and I found that the nutmeg was a tad overpowering, so I think next time I will cut it back to 1/2 tsp or a little over. And I suppose it's because i'm used to the Pilsbury cinnamon rolls, I found the dough a little off-tasting. These were definitely easy to make, and I do think I would make them again. Next challenge would be yeast ones, so I'll probably try out the Cinnamon Rolls recipe [http://www.ezrapoundcake.com/archives/380%5D next. I followed this recipe exactly but I couldn't get the dough to set up. It was way to sticky. I added more flour to the mixture. When I went to roll it up it was a mess. I was just laughing at the horrible mess I was making. I decided to bake the gooy concoction anyway. Needless to say, it did not turn out well. Yet another example of how bad of a cook I really am. I just made these, but with wholemeal flour, light evaporated milk instead of the cream and less brown sugar in the filling. Absolutely DELICIOUS!! Yes, you can use a combination of 1 cup of whole milk and a 1/2 cup of butter, plus an extra tablespoon of milk. These are awesome! The only thing I had to modify was the amount of spice. Even half the recipe was too strong for our pallets but they are still way good! I'll keep this recipe forever-thank you! cookies and cream or s'mores! Can these be frozen in the pan and then baked when ready to serve? wondering if it is possible to put raisins in them?? I love cinnamon rolls with lots of cinnamon, raisins, and icing on top…………………. seriously, you have no idea how many days i spontaneously wanted to bake cinnamon rolls but didn't have yeast…. i can't wait to make these now! thanks, you're the best!! These were very easy to make, but the taste and texture was not good at all. I followed the recipe as written. My 4 kids wouldn't even eat them.